FIVE years after starting to lose her sight, Judith Terry is finding new hope, and she credits Centacare with rekindling her spark for life. 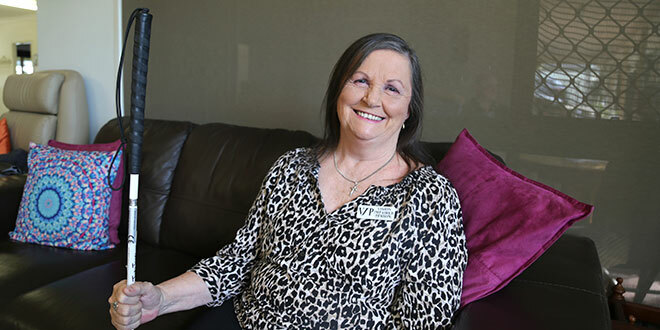 Ms Terry is among tens of thousands of Australians who has benefited from a government-funded home care package which provides high-level care and support and allows her to stay living at home and still enjoy an active community life. In 2003, the bright and friendly 69-year-old grandmother felt her life was falling apart after a blood clot caused partial blindness in her right eye, and then two-and-a-half years later she started losing sight in her left eye due to macular degeneration and glaucoma. “Suddenly I was left with only this tiny bit of sight and a deep sense of depression and loss,” Ms Terry said. Like many people who have thrived by living an active, independent working life, Ms Terry struggled to cope with her lack of mobility. Simple daily tasks seemed insurmountable. “I was deeply grieving,” she said. “(I was) very lost and laying on the lounge wondering what in the world am I going to do with my life. “And I thought, ‘Dear God, you might as well call me home’. Just at that time, a friend suggested Ms Terry ring Centacare, although initially, she had reservations. “I just didn’t have a vision for what Centacare did,” she said. She was not aware of home care packages, available through providers like Centacare, or that the Catholic agency worked individually with clients to meet their specific needs. The care on offer includes home support and clinical care as well as personal care – bathing or showering, the delivery and preparation of meals, dressing, fitting sensory aids, safety and emergency assistance aids, help getting around the home and connecting people with their community. Support services cover domestic duties like cleaning the house, washing and ironing, pet care, home maintenance and modifications, as well as respite care and transport to go shopping, visit a doctor or take part in social activities. Clinical care includes nursing, allied health and other therapies such as physiotherapy, wound care, continence aids, diet support and mobility aids and equipment. Importantly for Ms Terry, Centacare offered a connection with other people facing difficulties. After applying for and receiving a home care package (Level 4 support for high-care needs), she was able to start joining in daily activities at Centacare Enoggera Day Respite Centre, close to her home. Whenever she wants to attend, she is picked up and dropped off by a Centacare minibus. She enjoys a wide range of activities at the Enogerra centre as well as regular outings and picnics. “From the dreadful loneliness I was in, coming here has given me a great sense of hope – I’m part of a community of people here,” Ms Terry said. Providing care at home for older Australians was a major focus of last month’s Federal Budget. The budget provides $1.6 billion over four years to assist people to stay living in their own homes, avoiding premature placement in nursing homes. The funding boost sees an additional 20,000 high care packages being offered. This means close to 74,000 people will be able to access home care packages by mid-2022, although the care sector argues a far greater funding commitment is needed, with a current backlog of people either on a waiting list, or having packages that do not have the funding levels to provide the full range of services they need. Centacare Brisbane North general manager Desley Chorlton said the release of more funding for home care packages meant Centacare was in a position to offer greater care and support to people across Brisbane archdiocese. “We are anticipating there will be more people provided with home care packages, and our Centacare team right across south-east Queensland is ready,” Mrs Chorlton said. She said home care packages were provided to the individual, people had choice and control of which provider they wanted to deliver supports so there was no problem for people wanting to change from a current provider to join Centacare.